Our current economic expansion, already the nation’s second longest, continues. And yet, beneath the surface, it’s obvious this economic expansion is not like the others. The largest of Houston’s performing arts groups face massive disruptions and many millions in losses. If the details leaking out about the Trump administration’s 2018 federal budget are true, nonprofit organizations and those they serve are in for some very challenging times. New data show that 2015 was a good year for the economy and for the middle class and the poor in particular. Are the Donors in Donor-Advised Funds “The Promised Land” or Just Regular Folk? Fidelity’s 2016 Giving Report shows that its total donor-advised funds rival the largest foundations, but the donors give like the rest of us. 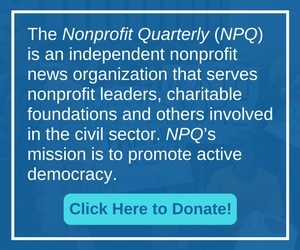 IRS statistics show nonprofit growth since the Great Recession, but in this piece, the National Center for Charitable Statistics delves into the numbers by subsector and finds that some did far better than others. Blackbaud has released its 2015 Giving Report, which shows overall growth in giving. But as NPQ continues to report, lots of data continue to show inequalities in terms of who gives and how much. Some Jewish Federations are flourishing after the Great Recession, but some are still struggling, and the gap between the two ends of the continuum is very wide.